This week, in the spirit of Halloween, I reread The Legend of Sleepy Hollow, by Washington Irving. I confess, I am not familiar with most of the works of this celebrated American writer, but the first time I heard this story as a fourth grader, it captured my imagination like few other stories ever have. Two hundred years ago, Irving created a countryside where “a drowsy, dreamy influence seems to hang over the land, and to pervade the very atmosphere.” Here in the quiet farmland along the Hudson River, descendants of the original Dutch settlers hold to old ways, old traditions, and old superstitions. It’s a place where the supernatural isn’t explained away, rather it’s relished and embellished in a cozy chimney corner. And chief among the specters inhabiting their stories is the Headless Horseman of Sleepy Hollow – an unfortunate Hessian cavalryman who lost his head to cannon fire during the not-so-long-ago Revolution. He roams the countryside by night in search of his head and is often seen racing along country roads to reach the church cemetery before daybreak. Enter into the community one most unassuming schoolmaster by the name of Ichabod Crane. “He was tall, but exceedingly lank, with narrow shoulders, long arms and legs, hands that dangled a mile out of his sleeves, and feet that might have served for shovels, and his whole frame most loosely hung together.” Mister Crane has a massive appetite, an eye for the prettiest gal around (Miss Katrina Van Tassel), and his own fascination with the mysterious. He’s a regular at community gatherings – notable for their amply-set sideboards – and enjoys nothing more than exchanging ghost stories by firelight after the evening’s activities exhaust themselves, which makes him a great favorite all around. Only Brom Bones – broad-shouldered, hard-riding, hard-fighting and prank-playing hero of the community AND rival for Miss Van Tassel’s hand – takes exception to his company. After one particularly lovely autumn evening of indulging in “the ample charms of a genuine Dutch country tea table” and the equally delicious ghost “tales, told in that drowsy undertone with which men talk in the dark,” Ichabod sets home on horseback. But he must pass through the woods of Sleepy Hollow, where “there was a contagion in the very air that blew from that haunted region.” With the stories fresh in his imagination, he bellows out hymns that resound across the night sky but do little to block out the goblins behind every bush. And then he rides with the Headless Horseman. In less than an hour’s read-time, Mr. Irving weaves together a fabulous, hilarious, unforgettable tale. This Halloween, I recommend that you treat yourself to The Legend of Sleepy Hollow. 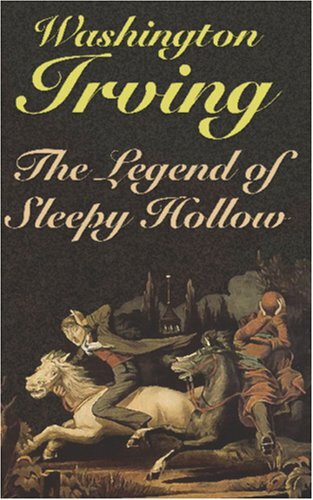 There are far too many versions of The Legend of Sleepy Hollow available to list them all, but I found a great, inexpensive Kindle download.